397 backers pledged €28,855 to help bring this project to life. Attraverso il Mongate è anche in italiano. Clicca sulla bandiera per vedere la pagina di KS in lingua italiana. Final stretch goal: If we reach 33.333 €, every backer from Sacrifice and above will receive this stunning print. Are you ready to answer her questions? Which virtue will you pursue the most? If you have played a computer role-playing game (CRPG), chances are Ultima played a part in its inspiration. Created by visionary Richard Garriott, and produced by his company Origin Systems, Inc., Ultima is one of the most important and influential CRPG series in the world. Through the Moongate illuminates the path of the Ultima games' history and the creative people behind this landmark series. It also covers some of Origin's other games, especially Wing Commander, and touches on several contemporary titles. Many of these tales have never before been told. Are you ready to step... Through the Moongate? My name is Andrea Contato, the author of Through the Moongate. While Ultima was born at the dawn of the computer role-playing game genre, my first encounter with it was quite late: in 1994 in fact, thirteen years after its first official release. As an avid video game player and having played Wing Commander, Origin Systems Inc. was not new to me, but Ultima was. As I began to delve into the history of Origin Systems Inc. and its co-founder Richard Garriott, I realized how closely intertwined it was with the genre of role-playing games in general. The careers of many of the most influential people in the industry of video games and computing were inspired by Richard, Origin Systems, and Ultima, and I took it upon myself to learn all that I could. It is a story that deserves to be told. Through the Moongate aims to be a more complete account of Origin's history than has ever been presented before. Parts of Origin's and Richard Garriott's story have been included in other works such as The Official Book of Ultima by Shay Addams and Garriott's own memoir Explore/Create, but this book is a work of new research. In the process I've interviewed dozens of people who were crucial to Origin's success, many of whom have worked for Origin, NCSoft, and Portalarium, and given them a voice. These developers and artists have helped to shed new light on Origin's fascinating story. As I traced the paths of the Ultima games and those who worked for Origin Systems, I began to realize the multitude of games that would not be possible without the influence of Richard Garriott, Origin Systems, and Ultima series upon the industry. To ensure their place in history, I've included special coverage of the Wing Commander and Ultima Underworld series, plus significant CRPGs and videogames of the era such as Star Trek (PDP), Empire and other PLATO games, Escape! and RobotWar by Silas Warner, Temple of Apshai, Wizardry: Proving Grounds of the Mad Overlord, Wizardry II: The Knight of Diamonds, Escape from Mt. Drash, Moebius: The Orb of Celestial Harmony, Autoduel, Ogre, 2400 A.D., Questron, Tales of the Unknown: Volume I, Wizadore, Dungeon Master, Times of Lore, The Black Onyx, Dragon Quest, and Xanadu. Writing this book was an exciting and unforgettable experience with a lot of ups and downs. It was always wonderful when I found someone to interview and learn an important bit of information. Sometimes, despite my best efforts, I wasn't able to track down a key member of Origin Systems Inc. or a friend of Richard Garriott for an interview. Fortunately, through the generosity of those I could contact, I was able to fill in the gaps in nearly all cases. It's been a long road from writing and researching to publishing this volume. I wouldn't have been able to organize the translation and editing without Andreas Przygienda and Ellouise McGeachie. Enrico Ricciardi provided indispensable help in printing the books and making the video and the trailer. Enrico was also instrumental to putting me in contact with Richard Garriott and Denis Loubet and gaining their direct involvement in the project. Enrico also created the art cover of the book (with the help of Ramon Cipressi for the 3D rendering). Digital edition: Epub and Kindle. English and Italian version available. Softcover edition: 6x9" (15x23cm), approx. 250 pages, black-and-white. English and Italian version available. Hardcover edition: 6.5x9.4" (16.5x24cm), approximately 240 black-and-white pages, plus 16 coated pages of color images and pictures from Richard Garriott's personal archive and Enrico Ricciardi's collection of Ultima games. The retro cover will feature unpublished artwork by the legendary Origin artist Denis Loubet. Each copy of the hardcover edition will be accompanied by Origin artist Manda's bookmark. Only English version available. You can find the complete index for both volumes here and more information on the project. Do you like Manda's artworks? I don't - I LOVE THEM. Manda is a gifted artist and an incredibly kind person. She helped with the writing of this book with lots of recollections told in an interesting and entertaining way. On top of that, she agreed to help us by designing a special (and awesome) bookmark in her unique Ultima style. One of the many things that made Ultima unique and unforgettable was the special certificate you could obtain when you completed a game. We'll have one too! 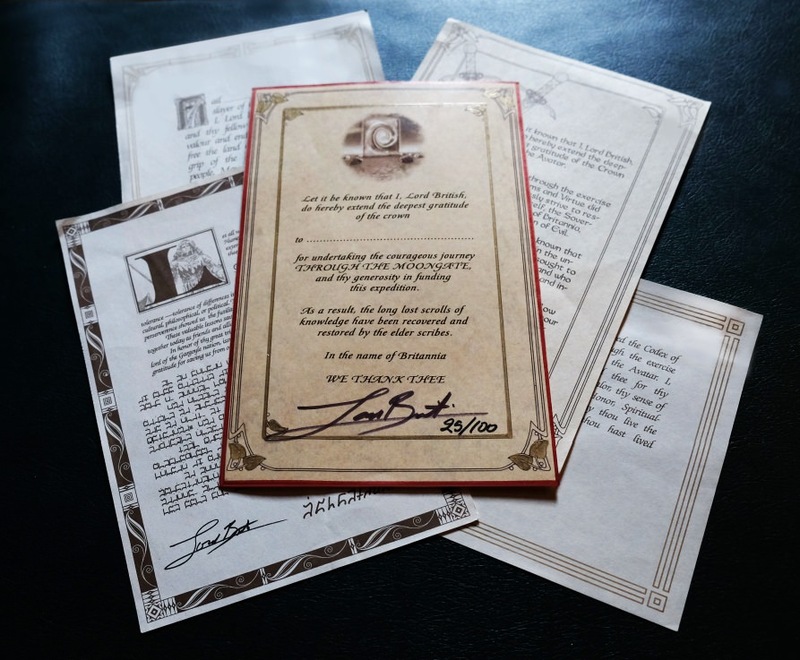 His Majesty Lord British (Richard Garriott) has agreed to hand-sign some unique, custom certificates to help us with this project. They are numbered and printed on premium quality "Turtle Pergamen" parchment paper. There will only be 100 made, so don't wait - when we run out, that's all there will be! New! The Compassion, Valor and Avatar tiers now include a limited-run print of the cover art! A unique collector's item, only 10 will ever be made. Each 6.3x6.3" (16x16cm) print will be on elegant "Silver Star" paper, signed by artist Enrico Ricciardi, and numbered 1-10 to match the number of the certificate signed by Lord British. It looks amazing! We worked hard to create backer tiers for everyone. With just 15 € you can have your copy of Through the Moongate digital edition (Epub or Kindle). The softcover edition (English version) will be printed in the US by Blurb and directly shipped. For this option, select Spirituality tier and the shipping cost will be automatically added to your pledge. For European citizens only, the softcover edition (Italian or English version) will be printed in Italy and then shipped to you. When creating and supporting a Kickstarter, the shipping cost takes a large part of the overall budget. This is especially true of international shipping. So, to cut down the costs, we are using a print-on-demand service and we will organize the orders on geographical basis. With the Honor tier and up, only tracked shipping* is available and added to your pledge. The hardcover edition will be printed only in English. We decided to print it here in Italy to ensure the overall quality of the print process would be easy for us to control directly. We really care about the Special Collector's Edition and we want it to be of the very highest, impeccable quality. * about shipping: International shipping of books is quite expensive and tracking globally is available at different levels of detail. Some tracking services give information until the package reaches the international drop point and don't follow the package all the way to its destination. When not explicitly stated, tracked shipping may not be available. Add-ons are bonus items you can add by increasing your pledge by the appropriate amount. Available for Honesty backers and up: Your pledge didn't include the e-book or only one e-book and you want the e-book in both languages (Italian or English version of Through the Moongate: Vol I)? We can fix it! Add 8€ to your pledge for one e-book and 15€ for both! More to be announced if goal is reached! When determining our minimum funding goal, we had to consider the Kickstarter fees (5% fee plus payment processing fees, between 3% and 5%), editing and translation costs, the layout and design of the cover, the artworks and the e-book, and of course, shipping costs. We did our best to lower our costs as much as possible to produce a reasonable funding goal without sacrificing the final quality of the book. If the target is exceeded, we are considering a number of exciting stretch goals, improvements to the book, and other rewards. So bookmark this page and stay tuned for stretch goals after launch! Loubet's draft for the back cover. Which one will be chosen? To write this book, I had the opportunity to interview the programmers, artists, designers, managers and musicians that took part in the story of Origin Systems and worked with Richard Garriott in creating his ambitious games. Follow our Facebook page, explore the official home page for the full index and information on the book, cool trivia and more, or feel free to contact me on Facebook, Twitter or directly through KS. For a sneak peek, we decided to share the chapter "Change of Guards". It's about the difficult development of Ultima VI, the first game in the series natively programmed for PC platform. I hope you enjoy reading it, and please leave feedback and let me know what you think! Click on the first page to download the PDF file. Remember: it's only for evaluation purposes. The risk is very low. The "Through the Moongate" book is already completed, and the editing and the translation are underway. All that's left is to complete the editing and translation, print the book, and ship it to backers. As a proof of the quality of my work, I decided to show a full chapter as a preview, so that you can evaluate yourself if it's worth your time and money. Thou hast lost an eighth! Just joking :) Your help is really appreciated and you'll receive a "Thank you!" email from the author and access to Kickstarter project updates. As previous tier PLUS a nice wallpaper of the book cover. You'll receive an e-book of Through the Moongate (Epub or Kindle; Italian or English versions. You must select one). You'll receive the paperback book version of Through the Moongate. Italian and English versions are available (select one). You'll receive the English hardcover Special Collector's Edition of Through the Moongate with Denis Loubet's back-cover artwork and 16 color pages of pictures and photos PLUS Manda's bookmark and the e-book. Tracked Shipping* available. Through the Moongate: Volume I, Hardcover Special Collector's Ed. You'll receive everything in the Sacrifice tier PLUS a special limited certificate signed by Lord British! The book will be also autographed by the author. Tracked Shipping* available. You want 2 copies of Through the Moongate: Volume I, Hardcover Special Collector's Ed. for you and your friend? No problem. Love tier is the right pledge for you. You'll get exactly what you would get with 2x Sacrifice but you'll save on shipping! 2× Through the Moongate: Volume I, Hardcover Special Collector's Ed. Why wait? You'll get access to the translated chapters as soon as they are ready and you'll be the first one to read the book! Includes everything in the Honor tier PLUS access to early access to the text (digital format). Trackable shipping* cost is included. As special Bonus: The limited certificate by Lord British is one of the first 10! Together with a matching numbered limited print of the book cover! Your name will be listed in the "Thank you" section of the book, along with the names of the Originites who contributed their recollections to help write it. All previous rewards from Compassion tier included. Trackable shipping* cost is included. Be the owner of the first certificate (1/100) and your name will be in the "special thanks" of the book. All previous rewards from Compassion tier included. Any stretch goal reward and add-on included. Trackable shipping* cost included.